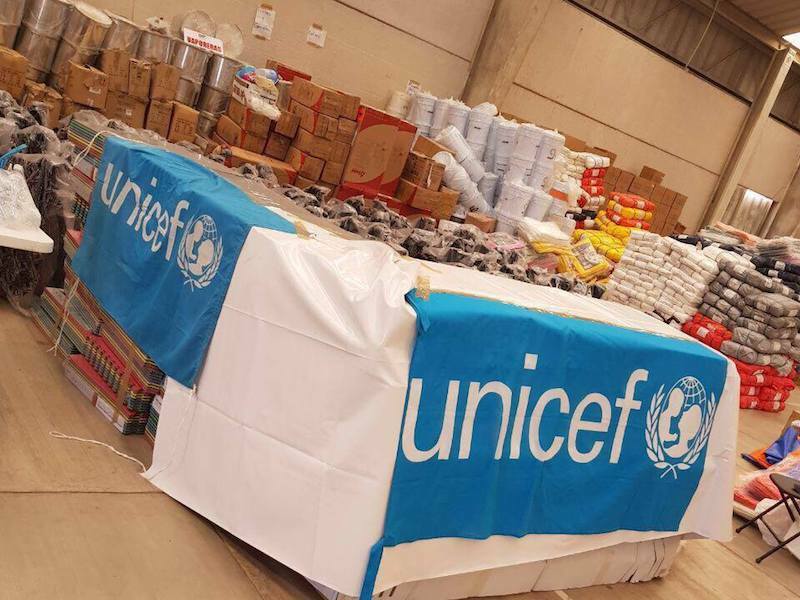 UNICEF provides badly needed support and supplies to help children and their families get their lives back on track. In the three months since back-to-back earthquakes hit Mexico, UNICEF has been hard at work supporting and protecting Mexico's children. To date, UNICEF has established 34 child-friendly spaces and 100 temporary learning spaces serving more than 7,000 children, distributed 410 School-in-a-Box kits and 20 early childhood development kits containing learning supplies for more than 17,000 children, and provided hygiene kits to 2,400 families. To help children cope with the trauma of life after the quakes, UNICEF has trained 353 teachers, who will in turn share tools and strategies for emotional support with more than 5,000 staff and caregivers. UNICEF also used U-Report, a social-messaging tool, to help 900 young people share their concerns and insights, which will help UNICEF strengthen ongoing advocacy and response plans. In the aftermath of two devastating earthquakes, UNICEF is on the ground, setting up and staffing child-friendly spaces, training teachers on how best to support traumatized children, and delivering education and hygiene supplies where they are needed most. 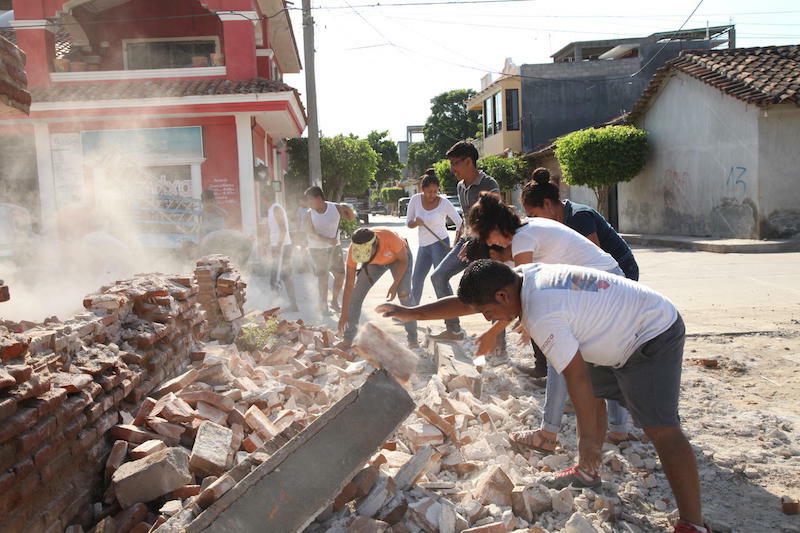 An estimated 7 million children live in states affected by the earthquakes (Oaxaca, Chiapas, Mexico City, Morelos and Puebla). Four million students will be temporarily relocated in other schools. "In emergency situations, children and adolescents have special needs in nutrition, health, hygiene and access to education and psycho-social support, which must be addressed over the immediate and longer term," says Christian Skoog, UNICEF Representative in Mexico. "If these urgent priorities are left unaddressed, the consequences for affected children and society as a whole could be severe." A magnitude-7.1 earthquake hit central Mexico on Tuesday, killing over 200 people and collapsing buildings and bridges in five states and in the capital. Entire towns have been flattened. Rescue workers and neighbors are scrambling to reach survivors still trapped in the rubble. Eerily, the quake struck on the anniversary of a powerful earthquake that devastated Mexico City in 1985, leaving 10,000 dead. Tuesday's destruction comes less than two weeks after an 8.2 earthquake struck near Mexico's Pacific Coast. The UNICEF Mexico Country Office in Mexico City reports that around 2.5 million people do not have electricity in the city and that at least 29 buildings have collapsed. The city is in chaos and phone lines are unreliable. According to news reports, at least 30 children died after a school collapsed in Mexico City, 75 miles from the earthquake's epicenter. Nearly 5,100 schools were damaged or destroyed in the quake. UNICEF Mexico shared a Facebook LIVE post by Country Representative Cristian Skoog: "Our thoughts are with all those affected in Mexico City, Puebla, Morelos and Mexico State. We need your solidarity and the support of all Mexicans in this very difficult time. Your support, your solidarity, your help. We count on you." The Mexico Country Office shared advice for families on its social media pages, counseling parents and caregivers to keep their children calm by giving them lots of love and attention, and offering safety tips: "Explain to children that they should stay away from debris and damaged buildings because they are not safe." Actress Salma Hayek launched a fundraising campaign to support UNICEF's work helping children and families hurt in Mexico's recent wave of natural disasters. She lost friends and an uncle in Mexico's 1985 earthquake, and remembers all too well the horrific aftermath. Hayek herself donated $100,000 to UNICEF. To learn more and donate to the campaign, click here. Facebook CEO Mark Zuckerberg announced that Facebook is supporting UNICEF's recovery efforts in Mexico by waiving fees on all donations to UNICEF made through Facebook tools. Immediately after the September 7 quake hit Chiapas and Oaxaca, UNICEF dispatched three Rapid Response Teams to assess the needs of the 2.1 million children and adolescents living in the affected areas. Educational materials and supplies for setting up child-friendly spaces can help children regain a sense of normalcy after a natural disaster. Photo from UNICEF Mexico. 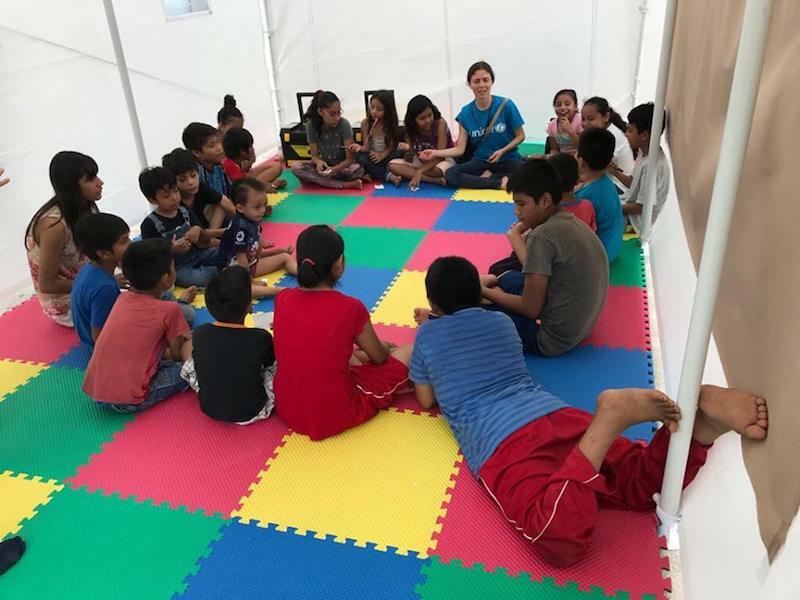 “After a traumatic experience as serious as this, it's key for children's recovery to resume their normal routine as soon as possible, and part of it is returning to school," said Pressia Arifin Cabo, UNICEF Mexico's Deputy Representative, from the southern state of Chiapas. Trained UNICEF counselors set up child-friendly spaces to give children a chance to talk about their experiences after the earthquake. Photo from UNICEF Mexico. As Mexico struggles to recover from this most recent natural disaster, UNICEF Mexico's priorities will be to provide urgently needed water, sanitation and hygiene, along with child protection and social and emotional support. In the weeks to come, UNICEF will be helping vulnerable children and youth to resume their educations as soon as possible.